↑ WikimaniaLondon (7 August 2014). 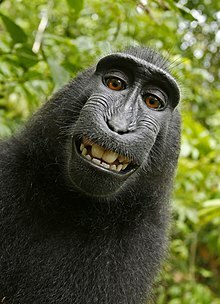 ↑ 18,0 18,1 A macaque monkey who took now-famous selfie photographs cannot be declared the copyright owner of the photos, Associated Press, January 7, 2016. ↑ Will the real monkey who snapped those famous selfies please stand up? ↑ Naruto, et al. v.